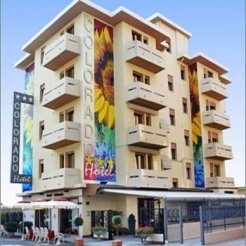 The Hotel Colorado is a family-run business, and is located in peaceful surroundings at 50 metres from the beach. It has been completely remodernized and equipped with all comforts: the hotel's private beach service with a beach umbrella and one lounge chair each, children's games and mini club, private parking, use of bicycles and a rich menu composed of meat and fish, buffet of vegetables, buffet-style breakfast. WiFi in rooms and common areas. An evening of live music and dancing is organized once a week to make our guests stay here even more fun and entertaining. Excursion Venice. THE PRICES INCLUDE: private beach service with 1 beach umbrella per room and 1 deckchair per person, private parking, use of bicycles, dancing, entertainment and mini-club for children on the beach, and a broad selection meats and fish, a vegetable buffet, and a breakfast buffet. Air conditioning in all rooms and common areas. Wi-Fi for internet access throughout the hotel. INCLUSIVE OF TOURIST TAX! Discounts for children depend on their age and on how many adults stay in the room.. The hotel's private beach service with a beach umbrella and one lounge chair each, children's games and mini club, private parking, use of bicycles, WiFi in rooms and common areas, TV sat, air conditioning, An evening of live music and dancing is organized once a week. Excursion Venice. CHIOGGIA: A populous and lively maritime city, which bleeds history from every stone. Of Roman origins, in the middle ages it was the second city of the Venetian Republic, it has an extremely original set up, cut into pieces by the canals and sown together by bridges. Known as " Little Venice", its small streets, all perpendicular at the square, are suggestive of the classic image of a fishbone. SOTTOMARINA now enjoys a beach which extends beyond the mouth of the Brenta, up until the... mouth of the Adige, in Isolaverde, renowned for its sandy terrain which is particularly well-suited for vegetation and is today a well-known tourist centre, endowed with modern infrastructure, surrounded by natural greenery. About 10km long, with a depth in some parts of around 300 metres, the beach of Sottomarina is appreciated by the entire coastline for the quality of its fine sand, with abundant presence of augite, quartz, silicon and micaceous elements which, together with a regular and constant breeze, makes it the ideal place for some therapeutic rest and an excellent tan. Its wide and welcoming shore is, without a doubt, the ideal place for long walks or for children to enjoy, or simply relaxing.